Recently I have seen more and more people request details on writing/creating a macro to help perform a specific action/procedure with Mindjet MindManager. Often they assume that this process of macro creation is similar to that found in Microsoft applications such as Word or Excel. You’re probably familiar with the process, where you record a sequence of keyboard and mouse actions that are saved to a VB driven code behind module and later recalled or replayed with a menu command or keyboard shortcut. Usually, this is quite a straight-forward process and often easy to implement, however, MindManager macros may share the same name but they are not the same beast and they require a basic understanding of programming and in particular the MindManager Object Model. 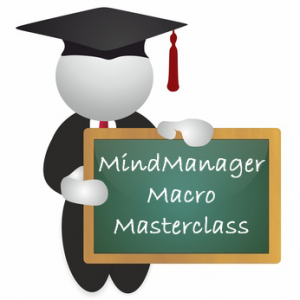 Fortunately, for those who would like to delve deeper into the inner workings of MindManager my colleague and friend, Nick Duffill has been working on a short course to introduce macro programming to those with an interest. Nick has asked Olympic to promote the preview course and gather comments to enable him to complete the content and format based on your feedback. For those who have not heard of Nick, he developed the first ever exports from mind mapping software to MS PowerPoint and MS Project in 1999, was the technical editor for Wiley’s “MindManager for Dummies” book, and has authored two editions of the Mindjet MindManager API documentation. Nick was also the man behind the successful Gyronix products, ResultsManager and GyroQ, and has worked for many clients around the world on custom projects with MindManager. Be assured, you’re in safe hands! What’s in the MMM Preview Edition? The Preview Edition of this course comes in a single zip file, the contents of which should be extracted to their own directory. 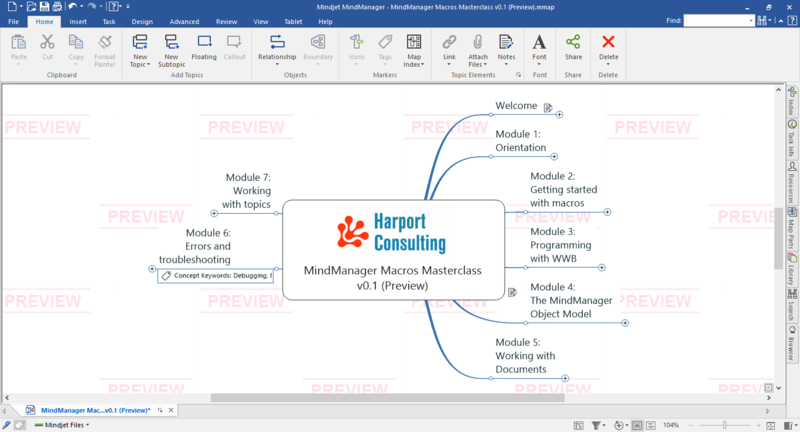 The zip contains 37 macro examples, 4 MindManager Maps, the main Dashboard is shown above, and a MindManager API reference PDF. Once extracted you should open the MindManager Macros Masterclass v0.1 (Preview) map to get started. This will then take you through the course developed so far, allowing you to get a feel for the content and format.